Please call (407) 847-0119 or contact us for help making selections. Raked Tree: Raking out your triple tree is optional, but your trike will not handle easily if you skip this option. Learn more here about rake and trail and why it matters. Click here for raked tree options. Steering Dampener: This is also optional but it can also assist with steering your trike. Click here for choices. 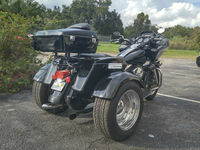 Reverse Drive: Most trike riders quickly get used to living without reverse, but it can make getting out of tight spots easier. Click here for some options. Body Kits: We have a number of body kits that you can buy alone, or with a package. Search by Make, Model & Year: Not sure where to start? Start with what fits by clicking here. "Love my trike! It was a gift I gave myself on my 65th birthday when I decided to ride my own instead of being a passenger." "My trike gives me a feel of freedom and serenity like nothing else....keeping my knees in the breeze every chance I get"
"Trikes are not only for us old people. Trikes are for the people that have rode all their lives and for some medical reason or another can't do the 2 wheels anymore......riding never leaves your system and it doesn't matter what you ride..just ride. We have rode for 30 years and am seriously thinking of getting one because of medical reasons. "